I spent the morning of my final day on South Manitou Island near my campsite deviating from my normal reclusive nature and socializing with several fellow campers that I had met the day before. Everyone I had met so far on this trip was extremely friendly, and I enjoyed getting to know a few of the people who were camping near me at Weather Station. At the campsite next to mine and directly overlooking the lakeshore bluff was a father/daughter pair of campers who had travelled to the island without the mother and sister who would normally complete their family. I didn't ask why this was (I was trying to be social, not nosy), but the dad eventually told me that the daughter (who looked to be around 10) was extraordinarily shy, and this trip was an attempt to draw her out of her shell a bit and get her to do a few new things on her own. It seemed to be working, as she eventually came over to my campsite to share an interesting bug with me that she had found burrowing in the sand. This also helped me out, as I am stupidly awkward with children and tried my best not to be an idiot. A couple who looked to be in their 50s was also camping near me, and this was their first experience carrying their gear in to a campsite (Weather Station campground is about 1 ½ miles from the boathouse and ranger station where the ferry drops visitors off). They were sleeping in a 4-person dome tent and had also lugged in a big air mattress. Luckily, they had to carry that stuff only for a short distance. They were very friendly and asked me for advice for future trips. A young, college-aged couple was camping next to them and had spent the day before climbing dunes. Everyone was happy and having a great time. It would be impossible not to. Unless you got poison ivy. This is the path to the beach near my campsite. Probably the most interesting person I met was a guy from Chicago, who was here with his three kids – two daughters and a son. His wife had become ill right before the trip, so he was going it alone. He looked like an old-school hiker – tall, skinny, bearded, said things like “far out” and “groovy”, and was really interested in talking about camping gear. He was also convinced that he had seen a rattle snake, and was telling the story with such lively detail and excitement that I didn't have the heart to tell him that was extremely unlikely. He found out later from a ranger that it was an eastern hog-nosed, which has a fake rattle for defense. After oatmeal and coffee, I packed up for the short hike back to the boathouse. Again, I followed the beach to South Manitou Lighthouse, which was bathed in rays of sunlight breaking through the overcast sky. Behind the lighthouse, near its outbuildings, there is a boardwalk that leads to the visitor center. From there it is a short walk on a sandy path to the boathouse, where hikers can drop their packs and leave them until the ferry departs. The sky had cleared, and I was in for another beautiful day on the island. I leaned my pack against the wall inside the boathouse and left to find a shady spot to make lunch. I ended up sitting on a bench under a tree, enjoying the lake breeze and deciding what to do next. I had arrived at the boathouse at 11:00 am and the ferry was not due to leave until 4:00 pm. Although the hike to Valley of the Giants is only six miles round-trip, there were other things to do nearby and I did not want to feel rushed. I am fascinated by trees, and I knew that if I hiked out there, I would end up spending who knows how many hours taking photos and might end up missing the ferry. This would not be the worst thing that could happen, and the island is prepared for such occurrences with a “Stranded Camper Donation Box” - a metal chest located inside the boathouse where campers can discard any unopened, non-perishable food items that they did not use on their trip. If the weather turns bad and the ferry cannot make the trip to the island, or if someone doesn't make it back to the boathouse by departure time, he or she will not go hungry while stranded. After lunch, I checked out historical information and artifacts in the visitor center, which is located in the island's former general store, then found a grassy spot in the shade near the ranger station to read until the tour of the lighthouse was scheduled to start. While bumming around the boathouse and ranger station, people who had been giving me furtive glances finally began asking me the questions that had obviously been on their minds. I had heard a few whispers here and there as people walked past my campsite at Weather Station, stuff to the effect of, “There's that girl who is hiking by herself!” I do not take offense to this, but I do find it funny that some people think this is the craziest thing in the world. It's not that I don't understand what they might be nervous about, but some people truly do not understand why a female would even want to do something like this on her own. Many women enjoy the outdoors, and if a friend or significant other isn't available or doesn't share the same interest, the choice must be made to either go solo or not go at all, which might mean missing out on a lot of things. This idea goes both ways, of course. At 2:00 pm I joined the small crowd waiting to begin the lighthouse tour. The ranger-guided tour reveals the history of the lighthouse, with details of its architecture and a trip up its spiral iron staircase. 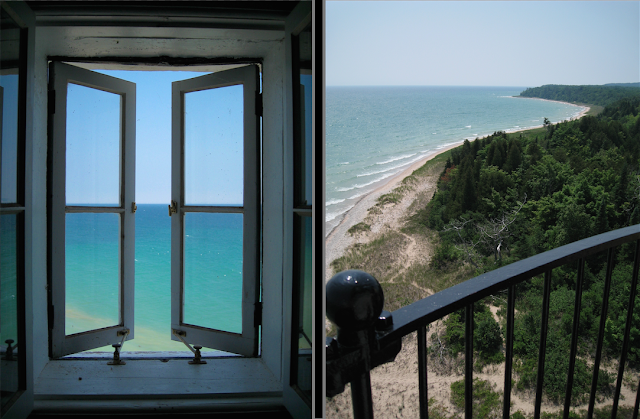 There are 117 steps, with platforms at various levels where the light keeper could look out windows to view the lake. At the very top, we were allowed outside onto the circular deck, despite the fact that the wind must have been blowing at around 1000 miles per hour. Everyone had to remove their hats and sunglasses if they did not want them blown right off. The view was outstanding, but I managed to grab only a few photos since it was difficult to maneuver my camera while holding on to my hat and sunglasses, while also hugging the exterior wall of the tower so as not to be flung over the iron railing by the wind. The day before (Saturday, July 16), the annual Chicago to Mackinac sailboat race had started, and by this time sailboats had reached Manitou Passage and could be seen passing through from the excellent vantage point of the observation deck. I should have thought a bit more about the strength of that wind when I made the decision to not take my motion sickness medicine prior to boarding the ferry at 4pm. I remembered the calm ride a few days earlier and believed I would be fine. Just before we left the dock, the captain informed everyone that we would be heading into some fairly heavy seas, making for a pretty rough trip back to the mainland. At about the ½ way point, we would be able to turn so that the wind would be at our back, but until then, things were going to be exciting. This was not good news. I thought about the research paper I wrote a few year ago about the history of Great Lakes shipwrecks and what makes these lakes so dangerous. They are so massive that they create their own weather system, which, at the moment, was not ideal for sailing. I immediately took two motion sickness pills, but knew that I might be in trouble, since it takes about ½ hour for the medicine to take effect. I was going to have to get through this voyage on an steadfast, iron-fisted refusal to get sick. As soon as the trip got underway, the show began. The small passenger ferry rocked back and forth and over swells, its bow climbing up waves, then crashing back down. I left my seat on the lower deck every once in a while to stumble around and distract myself when the nausea kicked in. Access to the open deck at the front of the ferry was allowed at first, and people cheered and screamed in fun while getting drenched by waves breaking over the sides. Gradually, some of the children's screams of fun escalated to screams of fright as the situation became less amusing, and the crew eventually made everyone return to their seats and closed off the deck. The ferry came very close to quite a few of the sailboats involved in the race, and as relieved as I was that this trip back to the mainland would be short, I was even more thankful that I was not on one of those boats. Later that night, the weather over the lake intensified to a severe thunderstorm, and two sailors from Michigan were killed when their sailboat capsized near South Fox Island to the north. Although conditions on Lake Michigan can turn dangerous quickly, theirs were the first accident-related deaths in the Chicago to Mackinac race's history. People come from all over the United States, and even other countries, to compete in this annual race, an event which started back in 1898. Once safely back on land, I hopped on the first shuttle to the Manitou Transit parking lot to retrieve my car. I was on the road and heading home in no time, with a 5 ½ – hour drive to think over the last few days. I felt very lucky to have experienced such an awesome trip; the weather was gorgeous, the scenery was spectacular, and I finally have a solo backpacking trip under my belt. I would gladly do the whole thing again sometime without hesitation. A few weeks after returning from South Manitou Island, I was contacted by someone at the Sleeping Bear Dunes Visitor's Bureau, who informed me that Sleeping Bear Dunes National Lakeshore had been nominated for Good Morning America's “Most Beautiful Place in America” contest. Viewers could cast their votes once the show narrowed all of the entries down to the top 10 contenders. Our little lakeshore made it into the top 10, and GMA aired a really nice spot featuring the area, their anchors clearly impressed and surprised by the little-known national lakeshore. Word spread quickly about the top 10 standing, and Michiganders showed their support, casting votes furiously. Amazingly, Sleeping Bear Dunes won, beating out places like Sedona, AZ; Aspen, CO; and Cape Cod, MA. There was some skepticism expressed in the print and online media about this; however, having just come from spending a perfect weekend on a quiet island within this beautiful lakeshore, I believe it is well-deserved. Reading your posts I always feel as if I am there with you. Thank you. Beautiful. B. It's a great thing to have made such a trip solo and gathered the memories within oneself. It's a far greater thing to capture glimpses of the experience and writing down your inner reflections to share with others. Thanks for taking me along, Nina! Why did you choose South rather than North Manitou? Is one favored over another in terms of scenery? I actually almost went to North Manitou, and definitely plan to go sometime. North Manitou is bigger, and almost all wilderness, so it would be great to hike there. I chose South Manitou because I wanted to see the shipwreck and lighthouse, and also because I didn't have very much time. I would like to go to North Manitou at some point when I wouldn't have to rush. Hello, I have enjoyed your blog very much! I am a female outdoor enthusiast from Michigan also, and I did my first solo backpacking trip on South Manitou too. I did it a bit differently, camping at Bay and day hiking from there around the island on the beach. I tried North, but since I was by myself I did not to wander off too far and did not see most of it. Your blog is a pleasure to read. Please keep reporting on your trips! Thanks so much for reading and for your comments! I appreciate it - I'm so far behind on blog posts that I am relieved people are still reading. Glad to hear that this got you interested in South Manitou -- I still need to get to North! I can't wait to finish planning our trip. I have one question it might be a little silly but how are the ticks? Not silly at all, but I don't really know the answer at this point. I haven't been there in a while and it seems ticks have gotten so much worse over the last few years. I would contact the Sleeping Bear Dunes Visitor Center and see if a ranger can tell you how bad/not bad they are on the islands. I didn't have any issues during my trip, so hopefully you won't either. I hope you have a great time!